I'm a Ph.D. graduate of UC Berkeley. My research is in the area of policy for the TV whitespaces. My advisor is Anant Sahai. 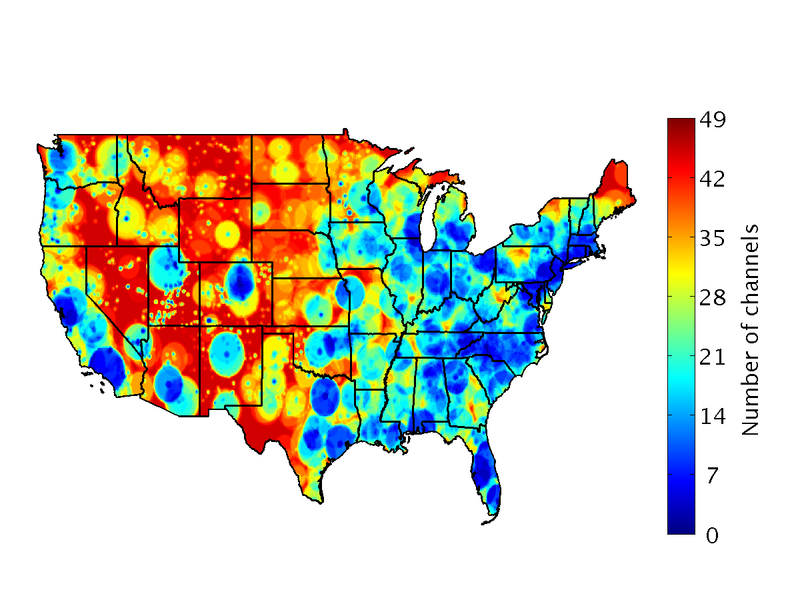 I am perhaps best-known for my whitespace maps. Published in our IEEE DySpAN 2010 paper, these were among the first visualizations that researchers had of the vast whitespace opportunity. Below you see a map whose colors represent the number of 6-MHz channels available for unlicensed use across the United States. Since then, I have continued to explore spectrum policy using an empirical approach. The Matlab code for the results in most publications can be found at github.com/kate-harrison/whitespace-eval. A newer and more extensible Python version is available at github.com/kate-harrison/west. 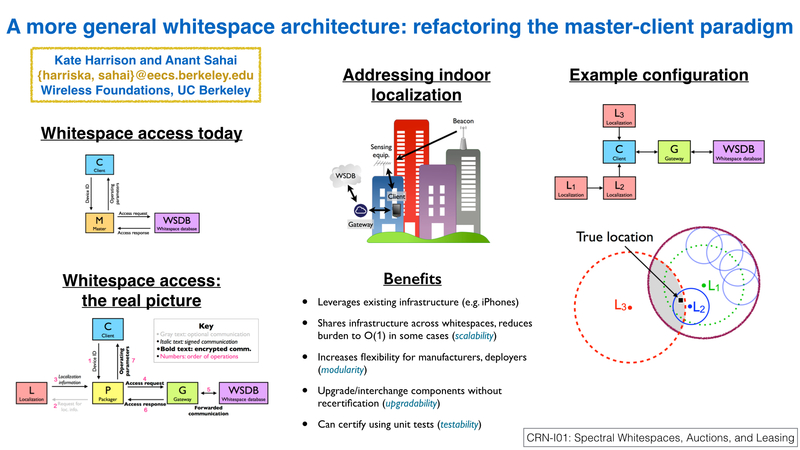 — Kate Harrison, Vidya Muthukumar, and Anant Sahai, "Whitespace Evaluation SofTware (WEST) and its applications to whitespace in Canada and Australia." 2015 IEEE Symposium on Dynamic Spectrum Access Networks, Stockholm, Sweden. — Kate Harrison, "A quantitative approach to wireless spectrum regulation." Doctoral dissertation, UC Berkeley, 2015. — Kate Harrison and Anant Sahai, "A more general whitespace architecture: refactoring the master-client paradigm." IEEE International Conference on Communications (ICC) 2015, London, UK. 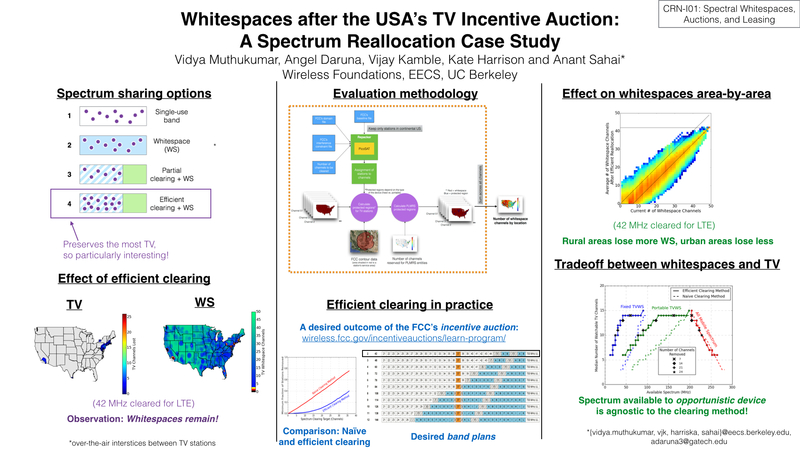 — Vidya Muthukumar, Angel Daruna, Vijay Kamble, Kate Harrison, and Anant Sahai, "Whitespaces after the USA’s TV incentive auction: a spectrum reallocation case study." IEEE International Conference on Communications (ICC) 2015, London, UK. — Kate Harrison and Anant Sahai, "Comments on the Part 15 NPRM." — Kate Harrison and Anant Sahai, "Proposal to address bootstrapping and non-geolocated device problems." — Kate Harrison and Anant Sahai, "Allowing sensing as a supplement: an approach to the weakly-localized whitespace device problem." 2014 IEEE Symposium on Dynamic Spectrum Access Networks, Mclean, Virginia, USA. — Shaddi Hasan, Kurtis Heimerl, Kate Harrison, Kashif Ali, Sean Roberts, Anant Sahai, and Eric Brewer "GSM Whitespaces: An Opportunity for Rural Cellular Service." 2014 IEEE Symposium on Dynamic Spectrum Access Networks, Mclean, Virginia, USA. — Kate Harrison and Anant Sahai, "Register everyone: on the whitespace use of wireless microphone channels, channel 37, and the soon-to-be guard bands." Tech report. — Kate Harrison and Anant Sahai, "Seeing the bigger picture: context-aware regulations." 2012 IEEE Symposium on Dynamic Spectrum Access Networks, Seattle, Washington, USA. — Kristen Woyach, Kate Harrison, Gireeja Ranade, Anant Sahai, "Comments on unknown channels." 2012 Information Theory Workshop, Lausanne, Switzerland. — Kate Harrison, "Cognitive radios in the TV whitespaces: challenges and opportunities." Master's thesis, UC Berkeley, 2011. — Kate Harrison and Anant Sahai, "Potential collapse of whitespaces and the prospect for a universal power rule." 2011 IEEE Symposium on Dynamic Spectrum Access Networks, Aachen, Germany. — Kate Harrison, Mubaraq Mishra, and Anant Sahai, "How much white-space capacity is there?" 2010 IEEE Symposium on Dynamic Spectrum Access Networks, Singapore. — Kate Harrison and Gireeja Ranade, "Dynamic Fractional Frequency Reuse in OFDMA Systems," UC Berkeley EE 224B class project, spring 2010. — Anant Sahai, Kristen Woyach, Kate Harrison, Hari Palaiyanur, and Rahul Tandra, "Towards 'A Theory of Spectrum Zoning,'" Allerton Oct 2009. Please direct all emails to harriska AT eecs DOT berkeley DOT edu. I'm on LinkedIn but you can also view my CV here. This page was made with Bootstrap.